I have just spent a week in Sydney, where Rugby League, is the popular local sport . The AFL, has announced that it issued a licence, to Sydney's second AFL team , Greater West Sydney . Kevin Sheedy , former AFL Richmond player and Essendon Coach is the man entrusted with the establishment and development of the new team. " "Sheeds" has played a major role in getting more indigenous players into the competition. At the NSW Art Gallery, a display of black and white photographs , showed the La Perouse Rugby League, indigenous team. Inspiring photos of a proud history . Saturday , was AFL match day in Sydney , when the Swans played the Hawks. A party atmosphere was in the air, as the jovial fans dressed in their football jumpers , guernseys, jerseys , made their way through, Surry Hills clogged streets ,to the SCG . None, seemed too concerned, about getting there , for the first bounce . Many would miss it . Brave Hawks fans, wearing their teams football jumpers, jerseys , guernseys, were mixed in amongst the crowd. The Swans , were victorious and the young indigenous player, Lewis Jetta ,kicked his first goal since being drafted to the Swans team earlier this year. An indigenous West Australian , playing AFL football , in the only Sydney team in the competition , on a saturday afternoon , at the SCG with 29.000 fans attending . AFL Football, on a local , interstate, and global level is attracting fans and players everywhere . 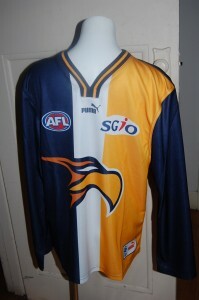 This entry was posted on Sunday, August 8th, 2010 at 10:00 am	and is filed under AFL, football jumpers, NRL. You can follow any responses to this entry through the RSS 2.0 feed. Both comments and pings are currently closed.